As I try on the dress, I hear a small bump and then a wail. I see Ruby sitting on the floor, in tears because she's fallen trying to walk in my shoes. She got pretty far, but her tiny feet are no match for 5 inch lug-sole platforms. I scoop her up, hug her tight, and she giggles and squirms out of my arms. She then tries to test out my clogs, but gives up in frustration when she can't maneuver her feet into them. Ever-resilient and resourceful, she finds some pink jeans in a pile on the floor. "Purple!" she says gleefully. Wow, do I love this little gal. 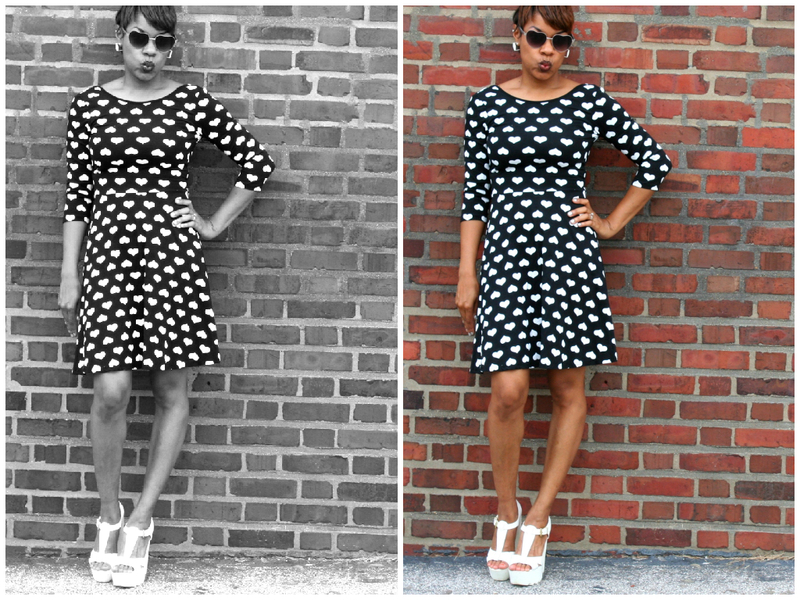 My misty eyes study my dress and its classic black and white palette. I'm not sure what I love more - the hearts, the cute bow on the back, or the fact that I can go all-out heart crazy and pair it with my heart-shaped sunglasses. Too much? Yes, in the best possible way. Kinda like the way my heart bursts, watching a 22-month old Ruby boldly shuffling around the room in my way-too-big studded combat boots. I love your black and white dress with those white sandals! You always look good! I also love the story about Ruby! So cute! Ruby is going to follow her Mother's foot steps with a good fashion sense!